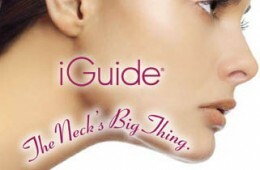 SPSS now offers iGuide Neck Lift! Hailing from the USA, and only just available in the UK , the iGuide Neck Lift has been described by plastic surgeons as a landmark procedure. Previously, the only option for counteracting sagging neck skin has been invasive and lengthy neck-lift surgery. Mr Wilson, consultant plastic surgeon at SPSS, recently reviewed iGuide Neck Lift, and being suitably impressed with the procedure and the results it gives, has decided to offer this revolutionary treatment in his clinic. Call us today on 0800 112 3393 for more information or to book a consultation with our experts or visit our page on the iGuide Neck Lift here.